Authors: Peter Kovari, Megan Beynon, Kanthi Hanumanth, Robert Mavri, Sudhakar Nagarajan, David Carey, Kristi Peterson, Tjark Kalow, ChenXi Zhang, Stephen Willoughby, Emilio Zegarra, Karthikeyan Ponnalagu, Balu G.
This IBM Redbooks publication provides detailed information about problem determination for various WebSphere products in a real-life scenario. It is a valuable resource of information for IT administrators, IT specialists and application developers. Part 1, “Introduction” offers an explanation of how the book is organized and how it should be used for problem determination. It also provides details about the solution chosen for the book to better understand the environment and to provide a real-life scenario. Part 2, “Problem Determination details” is the core of the whole book. 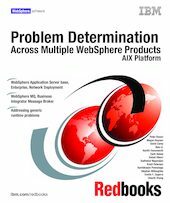 This part starts with two chapters discussing problem determination tools, one chapter for the runtime environment (AIX) and one for the development environment (mainly WebSphere Studio Application Developer V5). The following chapters go into details about problems (symptoms) with each product: WebSphere Application Server Enterprise V5, WebSphere MQ V5.3 and WebSphere Business Integration Message Broker V5. The “Appendixes” extend the book with problem determination tools on other platforms, mainly z/OS. It also provides insight into the methodology used for this book to document problems, tools and problem determination techniques.